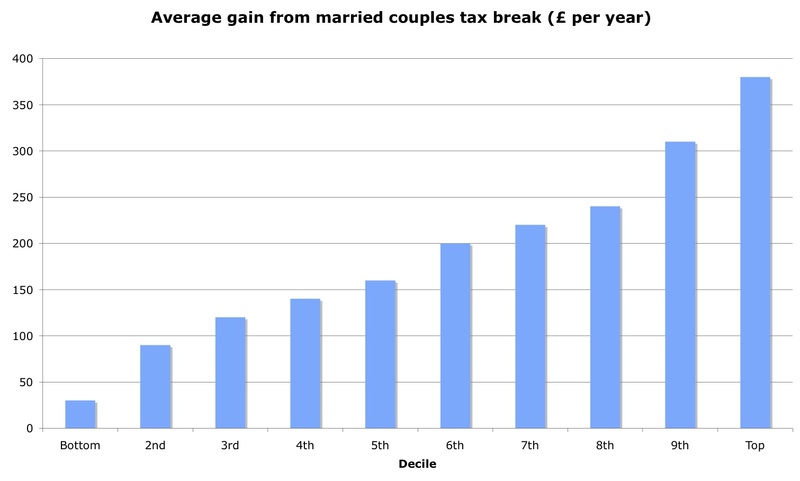 The Tories married couples tax break will be regressive. It will cost £4.9 billion with the richest decile getting a tax break 13 times as big as the poorest. A written answer to a parliamentary question shows the regressive nature of the Conservative party’s plans to provide a tax break for married couples. The chart below reproduced from the answer given to Lord Oakeshott of Seagrove Bay shows the distributional impact of the Tory policy. The policy is expected to cost £4.9 billion with the richest decile getting a tax break thirteen times as big as the least well off. This will raise questions about the party’s commitment to reducing inequality and comes on the back of revelations in yesterday’s Mirror about the £7 million windfall that Shadow Cabinet members would receive from reductions to inheritance tax. David Cameron has come under attack in recent weeks for claims he has made over poverty and inequality.